Highly concentrated, Erace is a great first step when opening your pool. Erace eliminates colored or cloudy pool water and stops the precipitation, scaling, and staining of the most common minerals found in pool water. Add Erace at the rate of 1 quart per 7,500 gallons. 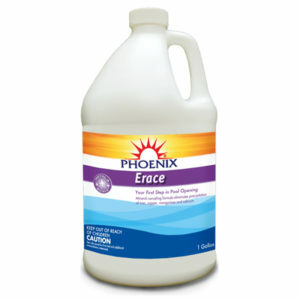 A 12-hour waiting period is sufficient for Erace to mix with the pool water before adding chlorine. Available in 1 QT, 1 GAL, 55 GAL DRM. 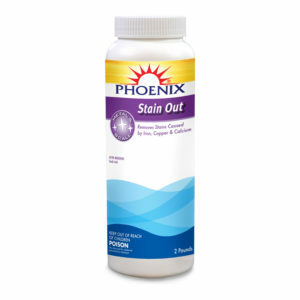 Highly concentrated formula removes sequestering and chelating metals (iron, copper, manganese), removes metal stains, restores water clarity as well as reduces scale formation on pumps and heaters. Super Erace works by forming a clear insoluble crystal with the metal ions normally found in the pool. These insoluble crystals are then removed by filtration. 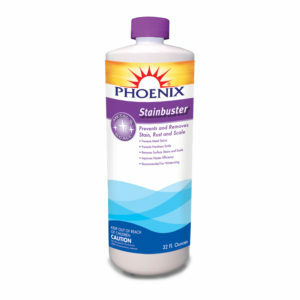 Removes Stains Caused by Iron, Copper & Calcium. Metal and metal ions occur naturally in the water used to fill your pool. As they accumulate, shifts in water chemistry or shock treatments can often cause them to fall out of solution and cause stains. 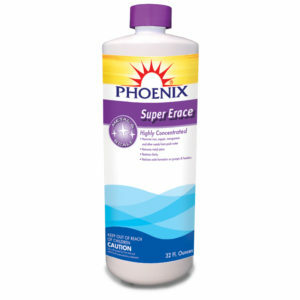 An excellent product to use when treating materials in pool water. It is also effective in treating light mineral staining on the pool’s surface. It also helps in preventing and inhibiting scale build up which can improve heater efficiency. Compatible with Biquanide systems. 16 ounces will treat 20,000 gallons of pool water. Available In Quart. Effectively reduces calcium hardness in pool water. Calcium Reducer is a uniquely formulated blend compatible with all sanitizing systems, restores water clarity and inhibits scale formation. When applied as directed Calcium Reducer will reduce calcium levels to the ideal range of 200-400 ppm.